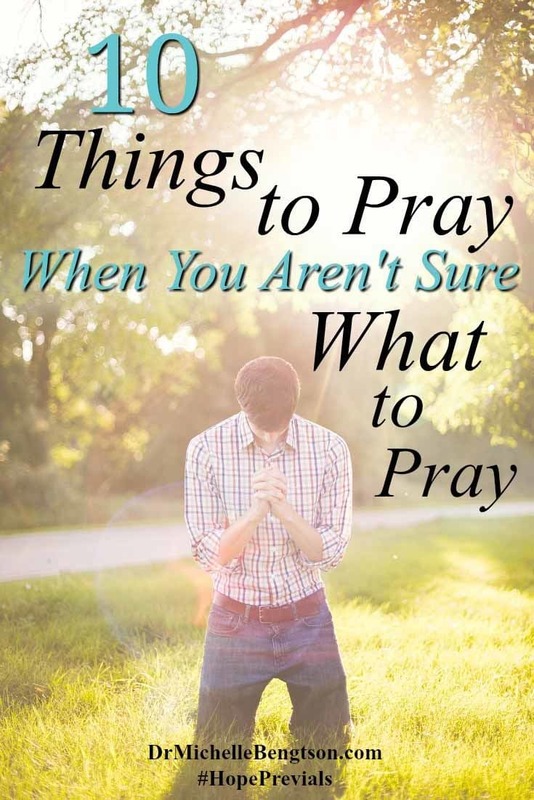 Do you ever have those times when you want to pray, you just don’t know what to pray? What do you do then? I congratulate you on your desire. That pleases God tremendously. He created us to be in relationship with Him, and our relationship grows most with Him when we are in prayerful conversation with Him. I have had those times in my prayer life when I’ve been at a loss for words. Sometimes because the pain in my life has been so great that I just didn’t even know how to express the pain or my need to God. While at other times I’ve been so overtaken with God’s goodness that sometimes I’ve been at a loss for words. When we don’t know what to pray, one of the best places to start is 1) praising God for who He is. Praising Him can help prepare our heart and mind for further prayer, to be transparent before Him and to hear from Him. Further, begin 2) thanking Him for what He has done for you and how He has provided for you in the past. So often we enter prayer with a mindset of sharing with God our needs and desires, when just as we as parents delight in hearing our own children’s gratitude, our Heavenly Father loves to hear our gratitude for all the ways He has blessed us already. If you’re unsure of what to pray, you might also 3) pray that He will help you hear His voice clearly. Don’t be afraid to 4) ask Him to prompt you regarding what you should pray. Scripture says that it is God’s kindness that leads us to repentence, and that others will know we are Christians by our love. 5) Pray that God will reveal any unconfessed sin that you need to repent of, and anyone that you need to forgive that is standing in the way of you fully loving others. God longs for our hearts to be quickened to the desires of His spirit. 6) Pray for wisdom and discernment of His will. And, along with that, 7) pray that He will help you quickly and readily obey His leading. We live in very dark times and we are called to be a light in dark places. 8) Pray that God will infuse you with courage to let your light shine so that you can be a positive impact for the kingdom in your area of influence. It can be very easy to become complacent when things are going well, or to focus on our struggle rather than our growth when difficulties befall us. 9) Pray that God will continue to grow and mature you in the wisdom and knowledge of Him. #Pray #God will grow & mature you in wisdom & knowledge of Him. Those who are in church leadership and ministry positions will be judged more harshly. They work long hours in demanding positions. Yet there is still much work to be done. 10) Pray for unity within God’s church, protection for His leaders, and effectiveness of the church’s outreach to the nations. #Pray for unity in God’s church, protection for leaders, effective outreach. There are so many other things that you could pray when you don’t know what to pray, but hopefully this will give you a place to start. I’m sure that once you start, He will bring other things to mind. I’d love to hear other things you pray for when you aren’t sure what to pray, in the comments below. Our new shop! Just in time for Christmas. Now is your chance to share the Hope that Prevails. 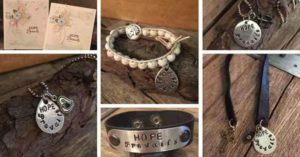 Check out the new shop with handmade, hand-stamped Hope Prevails necklaces, bracelets, bookmarks and stationery sets. So timely, Michelle. Thank you for your willingness to be obedient and serve others. This act of selflessness in impacting Heaven, guaranteed. Thank you Robin for your encouragement. We never know the impact we will have, so we must always just strive for simple obedience. 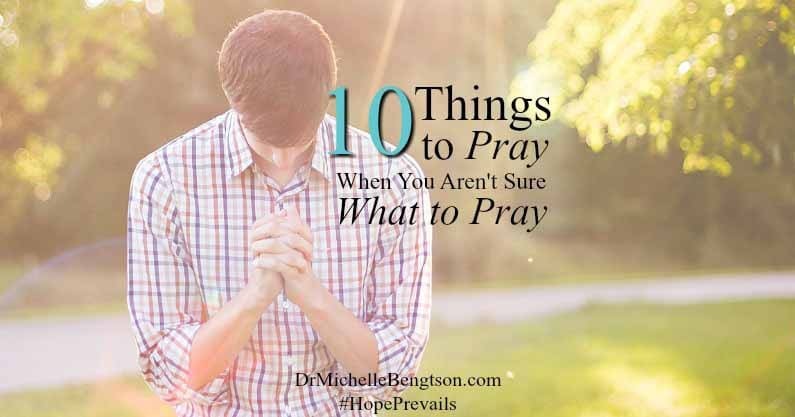 Thank you, Michelle, for these reminders of what we can pray even when we aren’t sure what to pray. It really does help to start with praising God for who He is. That leads to more thoughts of Him and the words to pray usually come. Blessings to you! I’m your neighbor at #Glimpses. Gayl, what better way to pray than to praise. It’s all about Him and who He is anyway. Blessings to you! 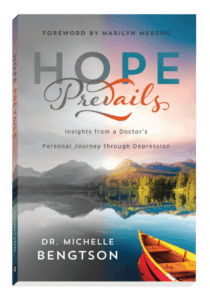 Thanks so much for helping me be reminded on prayers when I’m at a loss..your ideas are so helpful and useful at this time of my life when I’ve been praying for a need but with no prayers answered — great reminders! Visiting from nextdoor at #smallwonders! Angela, I find that it becomes easier with time, and yes, so very worth it!! Great list. I have to admit that I’ve been quite frank at times and just told God that I had no idea what to pray at the moment. Sometimes my mind can get so muddled that I can’t think straight. Much of the time, I probably don’t even know what I truly NEED to pray for. I try to remember to ask God to keep me on the path He wants me on because I surely can’t do it on my own. Thanks for sharing at Literacy Musing Mondays. 10 things is great, but the main thing is just to pray, right?! Good list, Michelle. Thank you for your beautiful reminder how to pray in faith, shared here with us at Tell me a Story.. I often pray and Thank God that He is working on bringing me the answer.